“Warm” and “human” are not two words you associate with Darren Aronofsky, but in The Wrestler he is both, thanks in large part to the heartbreakingly open and vulnerable performance from Mickey Rourke, the comeback story of 2008. It’s been a long time coming for Rourke, who has been doing tremendous, unshowy work in American indies and oddball pictures for years, all in supporting roles and character parts. But it still makes a great story given the parallels to the film, which is about a once-famous, largely-forgotten, pummeled-into-scar-tissue pro wrestler whose glory days were twenty years ago. Randy “The Ram” Robinson still lives in that past, at least as far as his taste in hair metal music goes, and pushes an increasingly broken body into the ring for regional cards in the show-biz hinterlands of rural New Jersey for a few hundred dollars a night. At least until a heart attack forces retirement on him and sends him to try to connect with the aging stripper he loves (Marisa Tomei, equally vulnerable but more wary) and reconnect with the daughter he all but abandoned (Evan Rachel Wood). Aronofsky gives his blue collar world of trailer parks and strip clubs an understated authenticity and Rourke makes The Ram a flesh and blood character of natural generosity who just needs to be loved can only find it in front of the crowd. It grabs for the heart and it squeezes, but with calloused, knocked-about brand of sentimentality. The accompanying 42-minute Within the Ring is a superior behind-the-scenes documentary directed with a rough-around-the-edge sensibility that matches both the film and the culture of its characters. Read my interview with Darren Aronofsky here. Peter Bogdanovich had wanted to make Nickelodeon in black-and-white, as he had The Last Picture Show and Paper Moon (“In color it feels made up,” he explains, “In black and white it seems more real”), but coming to the project after a pair of flops (Daisy Miller and At Long Last Love), the studios weren’t very accommodating. So he turned to retrospective reconstruction to desaturate the color and create a black-and-white version for this “Director’s Cut”-branded revision. Otherwise it only runs a couple of minutes longer and, apart from the B&W, I’m not sure what’s new or different about this cut. Both versions are an affectionate tribute to the wild frontier of the silent film industry, when the big studios banded together as the “Patent Trust” to shut down any independent outfit using their patented movie camera. Bogdanovich was inspired by the experiences of Leo McCarey, Raoul Walsh and especially Allan Dwan, directors he had interviewed in in the early sixties. Ryan O’Neal (dressed to channel Harold Lloyd) plays bumbling lawyer-turned-film director Leo Harrigan, just a guy who quite literally stumbles into the film industry and inherits an entire film company in the middle nowhere, and Burt Reynolds is the Florida rube hired to shut them down who ends up their leading man. Is black and white funnier than color? It’s hard to tell in this film because, while I’m fond of the affectionate movie history of the story and camaraderie of the characters, it’s just not that funny. Or even particularly clever. Bogdanovich fills the film with silent movie slapstick scenes, like What’s Up Doc? except in a Keystone Kops/Buster Keaton vein rather than classic screwball, but it rings off-key throughout. The DVD features both the original color theatrical version and the B&W Director’s Cut (the latter featuring commentary by director Peter Bognanovich, who likes to talk about his films) on one disc, and comes with the previously released director’s cut of The Last Picture Show (with new commentary by Bogdanovich) on a second disc. Caprica may be the first TV series to debut on DVD. This Battlestar Galactica spin-off/prequel doesn’t begin its run on SyFy (as the network formerly known as Sci-Fi is now branded) until 2010 but the feature-length pilot arrives on DVD this week. And it’s very much a pilot, establishing the characters of Joseph Adama (Esai Morales), a lawyer with connections to the mob (and the future grandfather of Commander William Adama), and Daniel Graystone (Eric Stoltz), a technology entrepreneur working on military robotics that look an awful lot like the future Cylons. It’s “dirty science,” according to his resentful teenage daughter Zoe (Alessandra Toreson), a visionary computer whiz in her own right. It’s all set “58 years before the fall of Caprica” (which is the beginning of Battlestar Galactica) and it’s decidedly Earthbound, set in a world where technology is creeping into potentially self-destructive territory and religious terrorists are (like the Cylons of the future) willing to kill in the name of the one true religion of a single, all-knowing God. A lot happens, but it’s less a story than a set-up of characters and conflicts they’ll play out in later episodes. But I do like the personal robots designed like stylized geese and portable computers on paper-thin sheets. Features commentary that delves into the needs and compromises of a pilot, video blogs seven deleted scenes. The Burrowers, JT Petty’s third feature, is another of his distinctively unusual takes on a generally conventional genre. Set in the Dakota Territory of 1879, where survival is already a challenge, Petty brings a starkly unglamorized sensibility to life and mortality on the Dakota prairie: it opens with a boy come a courting to a farmgirl only to discover a massacre and what appears to be the abduction of the girl. Clancy Brown and William Mapother, who have faces that look like theyâ€™ve survived tough times, are perfect as the leaders in a hunting party after a kidnapped girl: confident but unpretentious and very respectful of the country. But they think theyâ€™re tracking an Indian raiding party. What they find are fetid holes in the prairie ground filled with bone and blood and sinew, as if a body has been digested by the Earth. Which is close to the truth. Petty plays the unforgiving tensions between the settlers and the native tribes with palpable animosity, the distrust so great that their fragile truce snaps before they even take on the burrowers, the underground creatures that have been hunting on the prairie. He keeps the threat visually vague and the insect-like burrowers shadowy and smudged, creating his horror out of mystery and suggestion, but itâ€™s nothing supernatural or alien. Itâ€™s a real western/horror/monster movie with a devoted frontier sensibility and loving nods to The Searchers. The DVD features commentary with Petty and actor Karl Geary and two featurettes. See my interview with JT Petty here. 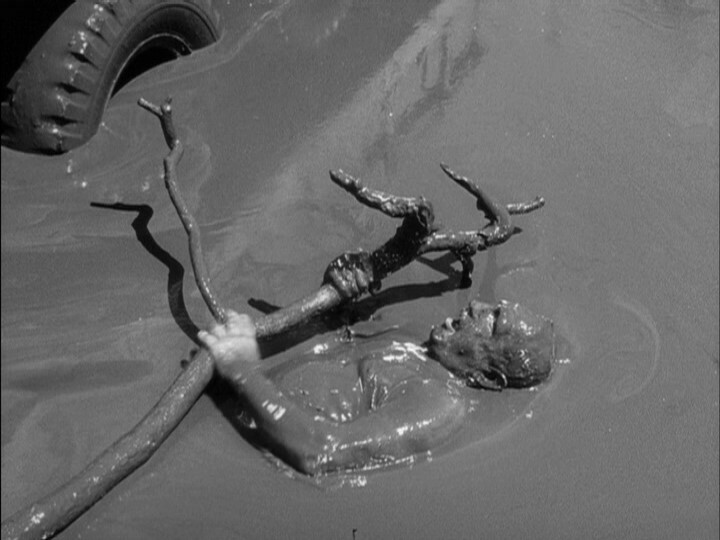 In Henri-Georges Clouzot’s The Wages of Fear, four desperate men (Yves Montand, Charles Vanel, Peter Van Eyck, and Antonio Centa) in a secluded South American town take a suicide mission to escape their squalid exile. All they have to do is forge through hundreds of miles of primitive jungle roads with a ton of unstable nitroglycerin in the back of their rickety trucks. Clouzot takes his time setting the story and his characters, desperate men whose flight from danger have landed them in an inescapable South American cesspool, and then offers them a way out with a veritable suicide mission. The second half of the film, a primal struggle of man and machine versus nature, soon becomes man versus man and finally a battle of nerves and endurance. Itâ€™s an unsparingly ruthless take on the human condition told as a riveting existential thriller, and the most grueling road movie ever made. Criterion previously put the film out in a beautifully restored DVD and now debuts the Blu-ray edition, featuring all the supplements of the DVD release. It’s also their first Blu-ray release in a more traditional plastic case, which may not be as environmentally friendly as their previous paperboard creations but is certainly sturdier and easier to access. Thanks for listening, Criterion. Originally published on the blog seanax.com.